The lunar phase or phase of the Moon is the shape of the directly sunlit portion of the Moon as viewed from Earth. The lunar phases gradually and cyclically change over the period of a synodic month (about 29.53 days), as the orbital positions of the Moon around Earth and of Earth around the Sun shift. The lunar phases and librations in 2019 in the Northern Hemisphere at hourly intervals, with music, titles, and supplemental graphics. The lunar phases and librations in 2019 in the Southern Hemisphere at hourly intervals, with music, titles, and supplemental graphics. The Moon's rotation is tidally locked by Earth's gravity; therefore, most of the same lunar side always faces Earth. This near side is variously sunlit, depending on the position of the Moon in its orbit. Thus, the sunlit portion of this face can vary from 0% (at new moon) to 100% (at full moon). The lunar terminator is the boundary between the illuminated and darkened hemispheres. "Waxing gibbous" redirects here. For the album, see Waxing Gibbous. In western culture, the four principal phases of the Moon are new moon, first quarter, full moon, and third quarter (also known as last quarter). These are the instances when the Moon's ecliptic longitude and the Sun's ecliptic longitude differ by 0°, 90°, 180°, and 270°, respectively. [a] Each of these phases occur at slightly different times when viewed from different points on Earth. During the intervals between principal phases, the Moon's apparent shape is either crescent or gibbous. These shapes, and the periods when the Moon shows them, are called the intermediate phases and last one-quarter of a synodic month, or 7.38 days, on average. However, their durations vary slightly because the Moon's orbit is rather elliptical, so the satellite's orbital speed is not constant. The descriptor waxing is used for an intermediate phase when the Moon's apparent shape is thickening, from new to full moon, and waning when the shape is thinning. The phases of the Moon as viewed looking southward from the Northern Hemisphere. Each phase would be rotated 180° if seen looking northward from the Southern Hemisphere. The upper part of the diagram is not to scale, as the Moon is much farther from Earth than shown here. A crescent Moon above Earth's horizon is featured in this 2010 photograph by an Expedition 24 crew member. This video provides an illustration of how the Moon passes through its phases – a product of its orbit, which allows different parts of its surface to be illuminated by the Sun over the course of a month. The camera is locked to the Moon as Earth rapidly rotates in the foreground. Non-Western cultures may use a different number of lunar phases; for example, traditional Hawaiian culture has a total of 30 phases (one per day). When the Sun and Moon are aligned on the same side of the Earth, the Moon is "new", and the side of the Moon facing Earth is not illuminated by the Sun. As the Moon waxes (the amount of illuminated surface as seen from Earth is increasing), the lunar phases progress through new moon, crescent moon, first-quarter moon, gibbous moon, and full moon. The Moon is then said to wane as it passes through the gibbous moon, third-quarter moon, crescent moon, and back to new moon. The terms old moon and new moon are not interchangeable. The "old moon" is a waning sliver (which eventually becomes undetectable to the naked eye) until the moment it aligns with the Sun and begins to wax, at which point it becomes new again. Half moon is often used to mean the first- and third-quarter moons, while the term quarter refers to the extent of the Moon's cycle around the Earth, not its shape. When an illuminated hemisphere is viewed from a certain angle, the portion of the illuminated area that is visible will have a two-dimensional shape as defined by the intersection of an ellipse and circle (in which the ellipse's major axis coincides with the circle's diameter). If the half-ellipse is convex with respect to the half-circle, then the shape will be gibbous (bulging outwards), whereas if the half-ellipse is concave with respect to the half-circle, then the shape will be a crescent. When a crescent moon occurs, the phenomenon of earthshine may be apparent, where the night side of the Moon dimly reflects indirect sunlight reflected from Earth. In the Southern Hemisphere, the Moon is observed from a perspective inverted, or rotated 180°, to that of the Northern and to all of the images in this article, so that the opposite sides appear to wax or wane. Closer to the Equator, the lunar terminator will appear horizontal during the morning and evening. Since the above descriptions of the lunar phases only apply at middle or high latitudes, observers moving towards the tropics from northern or southern latitudes will see the Moon rotated anti-clockwise or clockwise with respect to the images in this article. The lunar crescent can open upward or downward, with the "horns" of the crescent pointing up or down, respectively. When the Sun appears above the Moon in the sky, the crescent opens downward; when the Moon is above the Sun, the crescent opens upward. The crescent Moon is most clearly and brightly visible when the Sun is below the horizon, which implies that the Moon must be above the Sun, and the crescent must open upward. This is therefore the orientation in which the crescent Moon is most often seen from the tropics. The waxing and waning crescents look very similar. The waxing crescent appears in the western sky in the evening, and the waning crescent in the eastern sky in the morning. When the Moon as seen from Earth is a narrow crescent, Earth as viewed from the Moon is almost fully lit by the Sun. Often, the dark side of the Moon is dimly illuminated by indirect sunlight reflected from Earth, but is bright enough to be easily visible from Earth. This phenomenon is called earthshine and sometimes picturesquely described as "the old moon in the new moon's arms" or "the new moon in the old moon's arms". 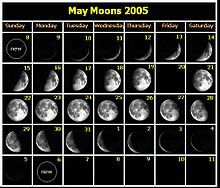 Photographing the Moon's phase everyday for a month (starting in the evening after sunset, and repeating roughly 24 hours and 50 minutes later, and ending in the morning before sunrise) and arranging the series of photos on a calendar would create a composite image like the example calendar (May 8 – June 6, 2005) shown on the left. May 20 is blank because a picture would be taken before midnight on May 19 and the next after midnight on May 21. Similarly, on a calendar listing moonrise or moonset times, some days will appear to be skipped. When moonrise precedes midnight one night, the next moonrise will follow midnight on the next night (so too with moonset). 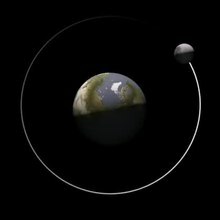 The "skipped day" is just a feature of the Moon's eastward movement in relation to the Sun, which at most latitudes, causes the Moon to rise later each day. The Moon follows a predictable orbit every month. Crescent moon over Kingman, Arizona. Each of the 4 lunar phases lasts approximately 7 days (~7.4 days), but varies slightly due to lunar apogee and perigee. The number of days counted from the time of the New Moon is the Moon's "age". Each complete cycle of phases is called a "lunation". The approximate age of the moon, and hence the approximate phase, can be calculated for any date by calculating the number of days since a known new moon (such as January 1, 1900 or August 11, 1999) and reducing this modulo 29.530588853 (the length of a synodic month). The difference between two dates can be calculated by subtracting the Julian Day Number of one from that of the other, or there are simpler formulae giving (for instance) the number of days since December 31, 1899. However, this calculation assumes a perfectly circular orbit and makes no allowance for the time of day at which the new moon happened, therefore may be incorrect by several hours (it also becomes less accurate the larger the difference between the required date and the reference date); it is accurate enough to use in a novelty clock application showing moon phase, but specialist usage taking account of lunar apogee and perigee requires a more elaborate calculation. The Earth subtends an angle of about two degrees, when seen from the Moon. This means that an observer on Earth who sees the Moon when it is close to the eastern horizon sees it from an angle that is about 2 degrees different from the line of sight of an observer who sees the Moon on the western horizon. The Moon moves about 12 degrees around its orbit per day, so, if these observers were stationary, they would see the phases of the Moon at times that differ by about one-sixth of a day, or 4 hours. But in reality the observers are on the surface of the rotating Earth, so someone who sees the Moon on the eastern horizon at one moment sees it on the western horizon about 12 hours later. This adds an oscillation to the apparent progression of the lunar phases. They appear to occur more slowly when the Moon is high in the sky than when it is below the horizon. The Moon appears to move jerkily, and the phases do the same. The amplitude of this oscillation is never more than about four hours, which is a small fraction of a month. It does not have any obvious effect on the appearance of the Moon. However, it does affect accurate calculations of the times of lunar phases. The lunar phase depends on the Moon's position in orbit around the Earth and the Earth's position in orbit around the sun. This animation (not to scale) looks down on Earth from the north pole of the ecliptic. It might be expected that once every month, when the Moon passes between Earth and the Sun during a new moon, its shadow would fall on Earth causing a solar eclipse, but this does not happen every month. Nor is it true that during every full moon, the Earth's shadow falls on the Moon, causing a lunar eclipse. Solar and lunar eclipses are not observed every month because the plane of the Moon's orbit around the Earth is tilted by about 5° with respect to the plane of Earth's orbit around the Sun (the plane of the ecliptic). Thus, when new and full moons occur, the Moon usually lies to the north or south of a direct line through the Earth and Sun. Although an eclipse can only occur when the Moon is either new (solar) or full (lunar), it must also be positioned very near the intersection of Earth's orbital plane about the Sun and the Moon's orbital plane about the Earth (that is, at one of its nodes). This happens about twice per year, and so there are between four and seven eclipses in a calendar year. Most of these eclipses are partial; total eclipses of the Moon or Sun are less frequent. ^ Strictly, the quarter phases happen when the observer–Moon–Sun angle is 90°, also known as quadrature. This is not exactly the same as having the Sun–observer–Moon angle a right-angle, but the difference is very slight. ^ "Hawaiian Moon Names". Imiloa, Hilo Attractions. ^ "Free Astronomy Lesson 7 - The Phases of the Moon". Synapses.co.uk. Retrieved 2015-12-28. ^ Origin: 1350–1400; Middle English < Latin gibbōsus humped, equivalent to gibb "(a) hump" + -ōsus "-ous"; "Gibbous". Dictionary.com. ^ "Phases of the Moon and Percent of the Moon Illuminated". aa.usno.navy.mil. Retrieved 2018-02-12. Wikimedia Commons has media related to Lunar phases.